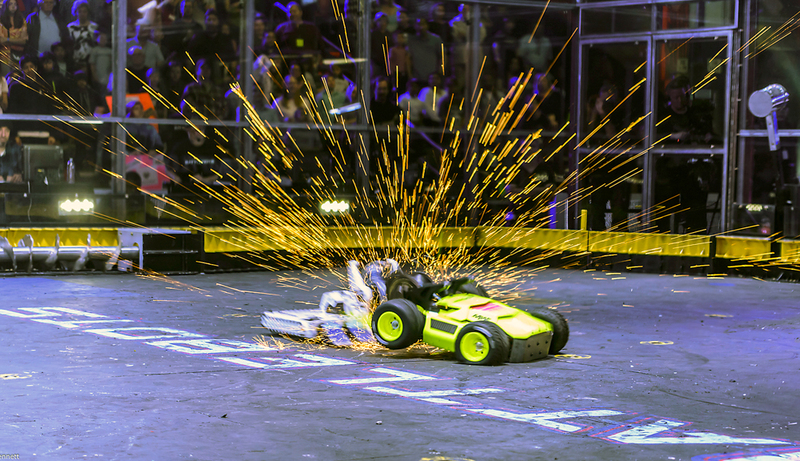 It has been called “the world's largest and most popular robot combat competition” and on Friday, Oct. 5, Worcester Polytechnic Institute (WPI) is celebrating BattleBots with a live viewing of the World Championship match airing at 8 p.m. on the Discovery Channel. In addition to watching the show on two of the campus’s largest video screens, WPI is hosting some of this season’s top teams on campus for viewing party and post show question-and-answer panel. Teams in attendance will include HUGE, SawBlaze, Valkyrie and Bite Force. The robot created by team Bite Force, which includes WPI alumni, Paul Ventimiglia ’12 and Jeremiah Jinno ’07, is competing in Friday’s finale. Friday, Oct. 5, 2018, 7:30 - 9:30 p.m. Question & answer panel 9 p.m.
Every Friday night since the beginning of the school year, WPI students have been gathering in campus buildings to watch BattleBots. Each week the crowd has grown in size and popularity, attracting the attention of robot enthusiasts beyond the university. The Oct. 5 viewing party is expected to be one of the largest BattleBots events in WPI history. BattleBots has a long history at WPI. Since the show debuted in 2000, several WPI students and alumni have created robots for the competition, including Ventimiglia, a three-time world champion. WPI is one of the lead sponsors of Team Bite Force. In 2007, WPI became the first university in the nation to offer a bachelor’s degree in Robotics Engineering. It launched a master’s program in 2009 and a PhD program in 2011. In doing so, WPI became the first university to provide bachelor’s, master’s, and PhD programs simultaneously, and is still one of only a handful of institutions to offer both graduate and undergraduate programs. Broadcast quality b-roll and interviews as well as high-resolution photographs from the event will be available upon request.